This was my first book and is, I think, still the most important in that it describes the fundamentals of managing the people and resources of health care. It aims to help you really manage, by engaging the enthusiasm and support of those around you, whether they are people you manage, people you work alongside, or people running your organisation. It differs from other books in dealing with practical situations, challenging your assumptions, and giving you new ways of understanding the dynamics you observe around you in health care. It enables you to become more confident and effective at delivering changes that matter within teams, services, and organisations. You can purchase it here and I believe you can sample individual chapters on Google Scholar. Several of the key concepts are summarised here in a chapter written for Judith Smith and Keiran Walshe in the second edition of their text Health Care Management. Much has been made of the distinction between management and leadership, but in health care this separation is unhelpful. Like the first edition, this completely revised edition of Really Managing Health Care describes a model, real management that brings the two elements together and demonstrates its application in health care settings. Drawing on theory across a wide range of management disciplines and illustrating these with practical examples, Valerie Iles succinctly answers three crucial questions: How can I manage clinical professionals? How can I increase the influence of my service? What changes do I need to introduce to improve the quality of care my service is offering? 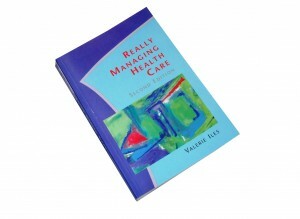 Written specifically for people suspicious of management jargon, Really Managing Health Care is designed for service leaders from across health and social care, and introduces ways of approaching the management task which recognize the particular dynamics of this field.